If you ask an artist why he or she chose the medium they use most frequently, the reply usually is that the medium chose them. That is certainly the case here, as Gordon Becker decided at age 11 that he wanted to be a woodcarver. 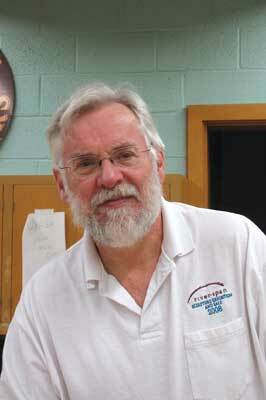 Many years of experience and adventure later he was finally able to accomplish that goal, and all the intervening steps helped to form the work that he now creates. It took time, and the accumulation of a variety of skills, to work out how to move beyond the limitations of 'the log'. In order to carve the human figure, especially in active poses, there has to be accommodation for points of weakness in the material. This is clearly evident in the history of sculpture when we look at Egyptian carvings, where the figures, in wood or stone, are confined to cylindrical shapes, and do not have extended limbs. In ancient Greek art, this gradually developed in stone sculpture, and the figure was released from the cylindrical form. But even there an extended arm, for example, usually required some sort of support, as the horizontal limb in stone cannot support its own weight. Hence the inclusion of a spear, a shield, or drapery falling to floor level, as support. In the woodcarvings of the Middle Ages, limbs were made of separate pieces, fastened together with metal or wood dowelling, and the joints covered with gesso and paint. But extreme positions were just not attempted in carving in the round. For almost three decades, Gordon Becker has concentrated on a series of dancers in which he literally defies the limitations of wood. 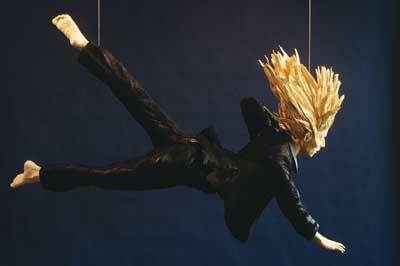 His figures are ethereal and expressive, implying action and motion, inviting the viewer into their world. 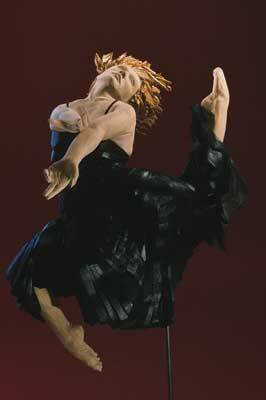 In describing this series Gordon has said: "I began carving dancers in 1984. I see in the effort, brevity, pain and exhilaration that is the spirit of dance, the most poignant expression of the dream of flying, of becoming the arrow of our longing. The arrow on the rock wall is in eternal flight. My dancers reach with their bodies and hands into a moment of transformation." Let us look at some examples in this series. 'The Red Dancer' (1994) is caught in the middle of a twirl. Her skirt, which is made of a series of partially shaped flat pieces of wood, flares out around her. The same technique is used for the torso and arms, adding to the sense of movement. Her hair, a wild tangle of distressed yew, follows the flow of the body and drapery. She is in full flight, entirely caught up in her own expressive movement. The 'White Dancer' (1995) is caught in a very athletic pose, every part of the body throbbing with effort and lifting motion, and her hair made of hawthorn branches equally expressive. 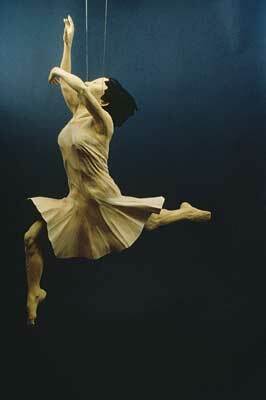 'Japanese Dancer' (1999) is suspended in mid-flight, her arms still lifting her body towards the heavens, her sedate costume exposing the details of her body as it is plastered against her by the rush of air. 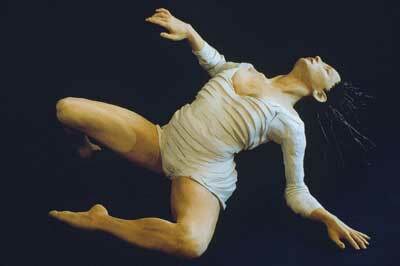 'Persephone's Dance' (2001) is a suspended figure, here holding a pose again in mid-flight. She has more drapery than the others, and once again the flowing drapery contributes to the impression of unbridled movement. 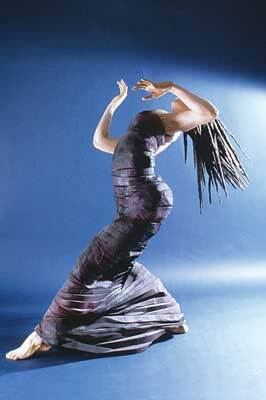 'Blue Dancer' (2002) is caught at the end of a leap, just landing, her hair flying about her head, still catching up to the body, skirts going in all directions, her face telling her own story of the dance. 'Black Dancer' (2002) is fully suspended by cables. Here, the figure is completely stretched out, defying gravity, her spiky hair almost like a crown of fire, the face full of concentration and introspection, all four limbs extended in different directions. 'Dance of Generations' (2002) is a more introspective figure, caught in the act of climbing over a fence, moving slowly from one place to another. In this case, the hair is also calmer than the other dancers, as she is illustrating a different aspect of the dance of life, thoughtfully moving from one stage to another rather than in vigorous action. 'Maroon' (2013) is the most recent work. She flies through the air with the appearance of effortless motion. Her arms are almost in the position of an archer releasing an arrow, as described in the quote on page 20. All of these dancers have individual stories, and are inspired by the artist's own experiences of strong women in his life, not all of whom were actual dancers. Each of the dancers is caught in a fleeting moment of transition, about to change pose the next second. They are superb specimens of physical power and control, professionals who have achieved a level of perfection beyond the limitations of ordinary mortals. 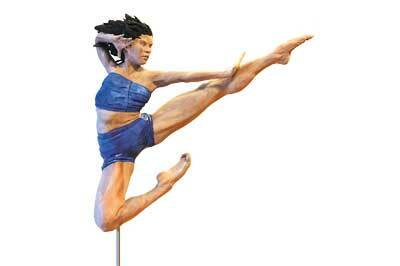 All are striving for physical expression in the art of dance. We, the viewers, forget for the moment that they are made from wood - that solid, heavy material which here has been made to seem light, airy and completely malleable. How is this achieved? The figures are life-size, with the exception of 'Persephone's Dance' and 'Maroon', which are both three-quarters life-size. In order to reduce the weight of the figures, the large elements such as heads and torsos are hollowed out, and where necessary for display, steel rods are inserted into the limbs to allow them to be self-supporting. Some dancers are suspended, others stand on the ground. The torsos are made of multiple thin slabs of wood, often left minimally carved, to suggest the motion of the dancer and the fabric. These rounds also suggest vertebrae which allow the body to move and twist as required by the dance, implying that the figure can and will change position momentarily. The limbs are made up of multiple pieces of wood, cut into wedges and glued together so that with every change of plane the grain of the wood flows with the anatomy. So, for example, an arm may consist of one piece for the upper arm; the forearm may be of two or three wedges in order to keep the grain flowing in the same direction as the musculature; the fingers will also be carved from a wedge, which allows the artist to carve with the grain to maintain the strength of the wood. It is a tedious process but one that allows for the maximum amount of strength and expression for every part of the figure. A brief comment about the use of paint. Some people believe that woodcarvings, with the exception of birds, fish, Santas and caricatures, should not be painted. But the whole historical tradition of woodcarving is filled with painted figures. From ancient Egypt through to the Renaissance and beyond, wooden carvings were painted, partly to make them more legible from a distance, but also because they would be considered unfinished if they did not have colour. The ancient Greek stone carvings were also painted, as were Romanesque carvings. Our aesthetic of unpainted surfaces has come about simply because these works have either lost their colour through weathering, or through excessive cleaning. All of the preceding discussion demonstrates that the limitations of a medium may not be as great as we think. With imagination we can extend the boundaries. But to those who say that the way to extend the limits of a medium is to ignore all tradition and teaching in the field, I must say no. It is only by knowledge of, and having expertise in, the full extent of traditional applications of any medium that we can push the limits to new boundaries. There is clearly a distinction between craft and art. Gordon Becker's work in wood is definitely art. Woodcarving did once hold a high position in the arts in a time before we made the distinction between art and craft. For a long time, woodcarving has more or less fallen into the category of folk art. But slowly, especially as figurative work is gradually returning to favour in other media as well, such as painting and prints, woodcarving is starting to regain a niche and recognition in the realm of fine art. 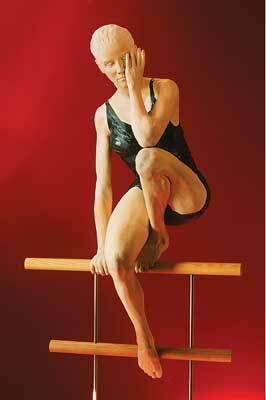 In these works we see the combination of two art forms, the art of dance and the art of woodcarving. Gordon Becker has said that when he first began carving these dancers, he kept hearing Stravinsky's 'The Rite of Spring' running through his head. With this group of figures, each viewer will be inspired to supply the appropriate music in his or her own head to accompany the dance. And hopefully these images will inspire other woodcarvers to expand their horizons and think more broadly about the possibilities of the art of woodcarving.